Some time ago I tried Todoist as a replacement for OmniFocus. It didn’t stick, largely because they don’t seem to take encryption seriously, so I was back on OmniFocus. 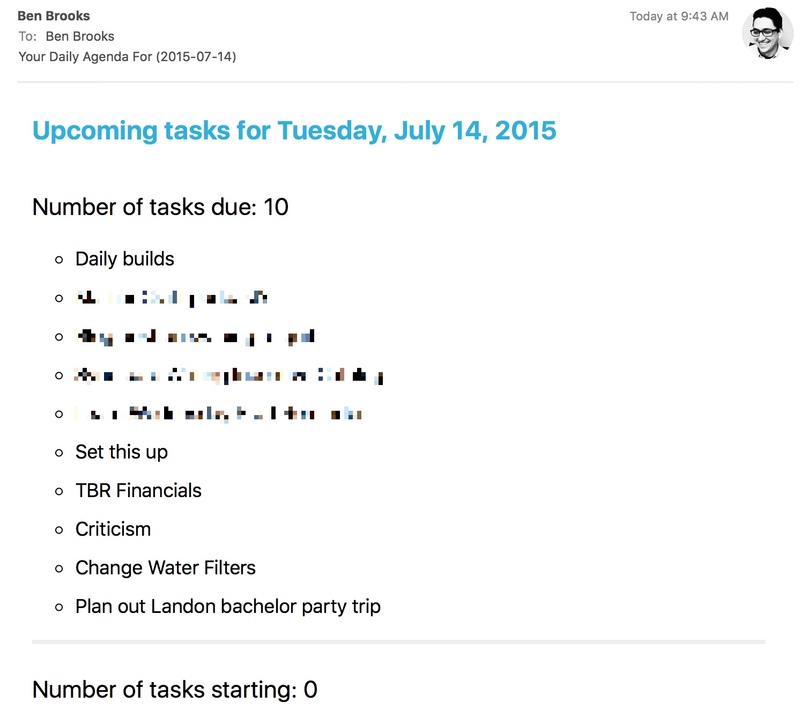 But the one thing missing from OmniFocus that I loved about Todoist was the email I received every morning telling me the tasks for the day. It was a really nice way to look at my day’s overview before I sat down at my Mac. I always check my email in the morning and rarely check OmniFocus — this was a great balance. I set out to replicate this with OmniFocus and have a pretty nice solution with AppleScripts and Keyboard Maestro. Essentially my Mac mini server runs a Keyboard Maestro macro everyday at 5:30a — that macro only triggers an AppleScript that takes care of sending out the email that I need. It’s not the sexiest looking thing, but it is html and does look OK. There’s some flaws, as you might notice there is no contexts, projects, or notes being shown. That was a deliberate choice of mine to keep this as simple as possible. This isn’t an email I work off of, or even keep in my inbox. It’s a one time overview of how much stuff I have to do today. It tells me if I need to say no a lot today, or if I have bandwidth for more. It’s pretty simple and really effective for me. You can check out the AppleScript here. Getting ready for the day with OmniFocus.